The first democratically elected Maldivian government was forced out at gunpoint on 7 February 2012 by elements in the military and opposition. An illegitimate government was sworn in right after the coup, replacing President Mohamed Nasheed with his Vice President Mohamed Waheed Hassan Manik. Violent crackdowns have begun, imposing an atmosphere of fear and repression. This is a call for the restoration of democratic order through immediate elections. Velezine Aishath For Want of Authority. Uthuru Freedom of expression and information is essential to press freedom. VOTE to restore order and stop police brutality logo editable artwork, can be used for making material, printing t-shirts etc. CMAG reiterated its belief that early elections should be called by the end of 2012 in Maldives. CMAG continued to be strongly of the view that the earliest possible expression of the will of the people was required to establish universal faith in the legitimacy of those who govern the country. The Group therefore expressed disappointment and deep concern at the lack of progress achieved so far through the All-Party Talks process to arrive at a political settlement in Maldives that would enable the holding of early elections in the current calendar year, as expected by the Group. It urged all parties to engage in dialogue without delay, in earnest and in good faith with a view to achieving agreement on the date of early elections, and the processes required to do so, including any necessary constitutional amendments and supporting legislation. Maldives police and military forces responded with violence against a peaceful rally backing the Maldivian Democratic Party (MDP), Amnesty International documented in the Maldives today, violating international standards against the use of excessive force. The new authorities in the Maldives must avoid persecuting members of outgoing president Mohammed Nasheed’s political party, Amnesty International said today, after Mr Nasheed resigned following a police mutiny in the country. The Group further agreed that, in situations where a member of CMAG was under scrutiny by the Group itself, its CMAG membership should be placed in abeyance as long as it remained on the formal agenda of CMAG. It decided, accordingly, that Maldives should not participate in CMAG during this time. The EU further calls on all political parties to immediately engage in dialogue, to commit themselves to early presidential elections and to determine the legislative and constitutional measures required to ensure that these are free and fair. 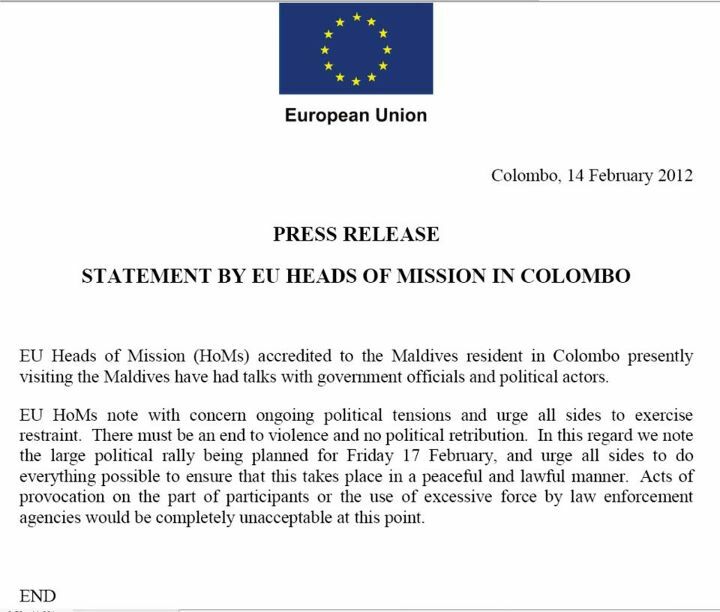 EU HoMs note with concern ongoing political tensions and urge all sides to exercise restraint. There must be an end to violence and no political retribution. In this regard we note the large political rally being planned for Friday 17 February, and urge all sides to do everything possible to ensure that this takes place in a peaceful and lawful manner. Acts of provocation on the part of participants or the use of excessive force by law enforcement agencies would be completely unacceptable at this point. How Do You Solve a Problem Like MPS? For Hassan Saeed. With love, a citizen. I am a woman too! What lies ahead for the MDP? Is Dr. Waheed presidential enough for you? Yes we need an Election!!! Coup d’état in the Maldive ?? Humanity and Beauty vs The Mean Machine Heads.. Lies, Manipulation and Protests: I want my country back! Keeping up Appearances over Keeping up Democracy? A Note From the Maldivians!! The Rally – You guys ROCK..! !